First day will be a workshop on gloss, with the aim to provide you the last progresses in the field of gloss perception, gloss comprehension and gloss measurement. The second day will be devoted to BiRD project progresses (Sparkle, BRDF and data files). 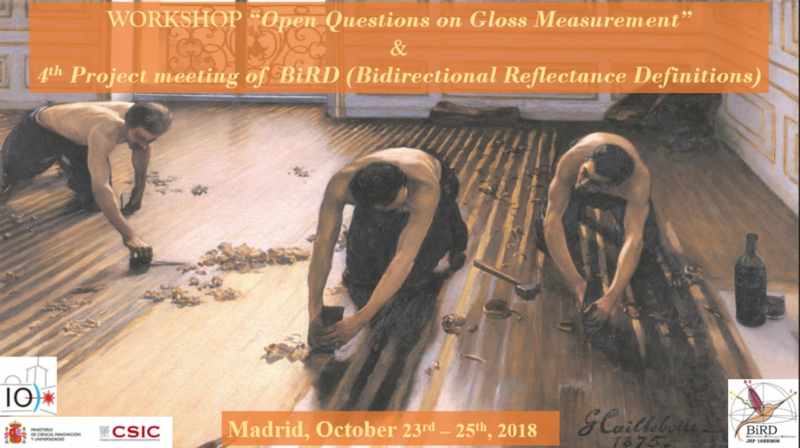 This workshop will be the opportunity to talk about research questions on gloss as a visual attribute and about issues and new developments with respect to gloss measurement. The workshop will be followed by the kick-off meeting of a new Joint Technical Committee (JTC) on Gloss which has been proposed to CIE and is pending to be officially approved. We would like to invite you to contribute to the workshop, by proposing a talk on the topic of gloss. It must be research oriented and non-commercial. If you are interested, please send a short abstract of 200-300 words to Ana Rabal (ana-maria.rabal-almazor@lecnam.net) before October 16th 2018. This abstract will be reviewed by the scientific committee composed of Frédéric Leloup (KU Leuven and propose co-chairperson of the CIE JTC on gloss), Gaël Obein (CNAM and propose co-chairperson of the CIE JTC on gloss), Esther Perales (Universirty of Alicante) and Alejandro Ferrero (CSIC). The final program will be published on October 17th on the website along with selected abstracts. The meeting will be focused in the progress of the project. The work done within every work package as well as the schedule of deliverables will be reviewed. A questions and answers session on the development and trends of the project will be held, so stakeholders and collaborators will be able to pose issues.